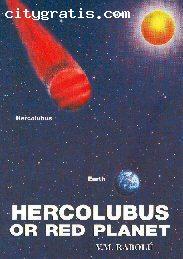 “Hercolubus or Red Planet” is a famous book written by V.M. Rabolu in which he has totally expressed the destructive events created by this planet namely Hercolubus. Hercolubus is a red coloured planet which is coming near to our earth and it can cause very destructive things i.e multiple earthquakes, tidal waves, volcanic eruptions etc. Alcione Association is giving away free copy of the book “Hercolubus or Red Planet”.